For many, the Gulf region has become synonymous with oil. However, these countries’ fossil fuel resources, though extensive, are finite. Even the Gulf countries need to prepare for a future without a steady stream of oil wealth. Developing their renewable energy resources also makes economic sense, allowing for a hike in oil prices. Some states have pursued it in the typical larger-than-life Gulf style by building enormous, billion-dollar “sustainable cities” meant to model renewable energy and clean technology breakthroughs to the world. While these technology showcases are scientifically interesting and aesthetically pleasing, what is the benefit of these utopian desert cities? Masdar City in Abu Dhabi is one such project. The Masdar Company describes it as a city “designed and operated to provide the highest quality of life with the lowest environmental footprint – all in a manner that is commercially viable.” Construction began in 2008 and is slated for completion in 2016. It aims to be a carbon-neutral zero-waste city – a silicon valley of renewable technology in the Gulf. So far, only one block of six buildings has been built, and the project has been plagued with problems, including solar panels in the shade, budget cuts, job losses, and difficulty earning carbon credits,. Because of Masdar's rocky start, it has lowered its goal from carbon-neutral to carbon-friendly. The completed structures boast an energy consumption reduced by 50%, a cooling load reduced by 40%, and water consumption reduced by 54%. Even the construction process has been taken into account—96% of construction waste has been recycled. While these achievements are considerable, the national grid, powered by fossil fuels, still supplies some of its electricity. Masdar has taken steps towards improving sustainability for a wider audience of Emiratis. The Masdar Company has started a website where it lists local businesses that have met its 15 rigorous sustainability criteria. Masdar is also researching renewable desalinization plants, which are currently the biggest source of Abu Dhabi’s carbon emissions. However, this research is still in its preliminary stages. 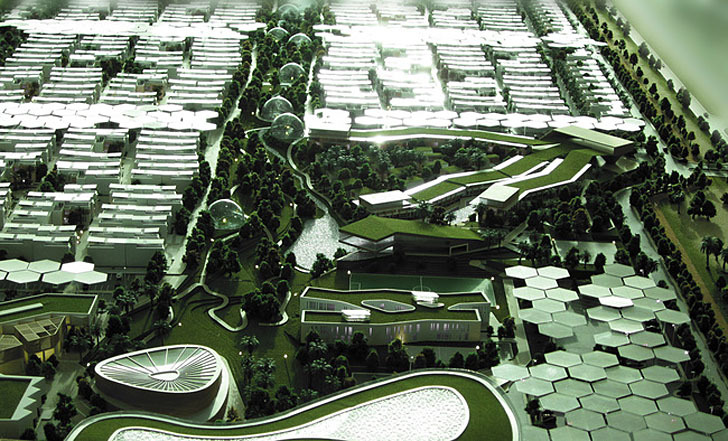 Dubai is also developing the Dubai Sustainable City, whose construction is planned in four phases. The first phase consists of 100 townhouses and is slated to be completed in 2014. In addition to 550 townhouses total, the city will include a school, shopping mall, and commercial center, as well as sustainable tourist attractions including a deluxe hotel and resort, a planetarium, and an amphitheater. Diamond Developers, the firm building phase 2 of the city, plans on making 50% of the city green space and equipping all residences with solar panels that will provide 60% of their power. The Dubai Sustainable City is expected to have 75% fewer emissions than a typical gulf city. While the initiative is impressive, the projects are neither practical nor cost-effective and cannot easily be replicated or sustained elsewhere. These cities will not significantly affect the carbon footprint of their respective emirates, and inaccessible to most of their residents -- 90% of the United Arab Emirates’ labor force consists of impoverished guest workers who could not afford to live in such developments or patronize their amenities. Historically, model cities such as these have had little influence on global development. As one of the worst per capita polluters in the world, Abu Dhabi might have been better served investing the $22 billion cost of Masdar into creating programs and incentives to encourage sustainable projects such as solar energy among its residents, as no such incentives currently exist. There are more practical ways to encourage sustainable energy use in the Middle East. One critic of Masdar suggested that a more useful alternative would have been to better insulate Bedouin homes and provide them with solar panels. Other Gulf countries are already taking steps towards renewable energy on a national scale. Saudi Arabia has embarked on an aggressive renewable energy program, although it is still in its very early stages. The Kingdom plans on doubling its electrical capacity by building 54 GW of renewable energy, mostly from solar power, by 2032. It will begin by installing 70 stations across the country to measure solar energy potential. Ten stations have been built so far. Saudi Arabia has also invested in nuclear power, with hopes to provide 20% of that country's total power. Accordingly, the Saudis signed an agreement with China in 2012 to build 16 nuclear reactors by 2031, at a cost of $100 billion. It is up for debate whether these efforts are based on the concern for sustainable energy capabilities or an attempt to stay relevant in the energy market as consumers seek out alternatives to oil. In either case, Saudi Arabia’s actions are far more effective at developing its renewable energy potential than a sustainable city. Kuwait and Qatar are both planning more useful energy developments as well. Qatar has a plan to make 10% of the energy used in its desalinization plants solar by 2018 and Kuwait aims to use renewable energy for 10% of its power requirements by 2020. Beyond individual countries' attempts to foster innovation in this sector, there is a notable regional approach as well. Governments and private enterprises will meet to discuss the logistics of solar power and other sustainable technologies this September at the GulfSol 2013 Summit in Dubai. The event expects 5,000 local and international participants to attend and will include workshops by industry leaders. Hopefully, summits such as this will serve as a catalyst for broader regional collaboration in renewable energy developments. It’s encouraging that Gulf countries are interested in developing their renewable energy resources. However, “sustainable cities” demonstrate that they’re more interested in flashy, trendy green concepts. Instead, the Gulf countries should continue to invest their resources and time in practical, replicable, sustainable models of energy consumption. If so, the future will see the Gulf states as a hub for pioneering green policies and technologies that will have a more widespread influence than these isolated oases of green technology.